View it below 1) On home screens, laptops, large devices, read on this page & enlarge YOUR VIEW. 2) On Smartphone - download HERE then enlarge your download. ​3) To print a HARDCOPY. Download at HERE above. Print in Landscape on A4. These 2019's DAILY TIMETABLES, will be updated with the final working programme LATER. The many varied day / eve activities, click onto EACH day LATER, when this becomes available! Format : As if on 2 A4 sides and titled "PICK-UP a copy"
NB. PROVISIONAL means: initial contacts are made, but times / contributors may be CHANGED! ThIs 2019 MONDAY TIMETABLE, will be updated with the FINAL working programme LATER. ﻿﻿﻿﻿Saturday 27th April 2019 Here you are at the Saturday webpage. ThIs 2019 SATURDAY TIMETABLE, will be updated with the final working programme LATER. Monday 25th April 2016 PLAN IT - LOOK AHEAD NOW - Take a break with us. Partake on Monday 25th April; to look forward to a fully open bluebell spectacle. A Spring experience not to miss. Take advantage of Monday as the BEST quiet day to really get to know Karin and her dances. We hope with Nel to learn one or 2 short, catchy ones. (The hall we have wished and tried to hire from noon, to assist in setting-up. We can use the hall facilities from 1pm. The Friday evening's dance is a lively American Contra. ﻿With much poor weather in 2018, many joined the almost continuous activities in the Hall. click HERE to see the "Cole Valley Ceilidh Band" playing on Friday eve in 2014, for that years' contra dance. - likely again just £39 for all 4 days. (Ensure that you have lined-up Accommodation). From the end of January Later Bird Season Ticket will be available. You receive more individual attention Fri afternoon & especially the quieter Mon﻿day. The INDOOR pic [in changing title pics above] was of Nel's 2009 visit. 1pm F﻿ri 27th to late afternoon Mon 30th April 2018. In April 2016, for longer than usual, we took part in excellent workshops in the Hall whilst it was cold outside. On Fri evening we'll mainly dance in American Contra style. More general social dancing is on Sat & Sun evening. BOOK / or just COME & ENJOY these events. Should it be wet out, we dance Morris & around the Maypole INDOORS. It's convivial, and we always provide a variety of different dancing. Book - still cheaply - or DROP BY - on any day /evening : Be welcomed - whichever day - at ANY time ​! In 2018, drop by- on any day /evening : Be welcomed - whichever day - at ANY time ​! Instead of various bands playing for us, you have this April, a unique opportunity fully to experience the widely versatile musicianship of Jaige & Adam. Visiting from Canada - there and in the USA they play in bands Crowfoot & Maivish. Enjoy the music & songs by clicking on their websites. They will bring CD's with them. Joining us also is Aubrey, born in November. What happened at Great Alne last time is your best general guide to what will take place in April next year. May 2017's ﻿FRIDAY﻿ ev﻿ents ﻿:﻿ 2017's SATURDAY﻿ ev﻿ents ﻿: 2017's﻿﻿ SUNDAY ev﻿ents ﻿:﻿ The quieter ﻿MO﻿NDAY in 2017. An early booking gives you the best variety of choices. Later, more of your "clicks" on the prices show their availability has become taken for your requested dates. Note: DISTANCES to travel from/to other Travelodge accommodation are given FROM ALCESTER. The fast, yet relatively quiet A46 dual carriageway South from Alcester means that accommodation just North of the delightful historic town of Evesham may be less than 20 mins drive from Great Alne. Some is offered there through Airbnb at very reasonable cost. Friday 27th at £26, Sat 28th at £43 and Sun 29th at £29. Best discount presently includes a Friday afternoon & all Monday of an extended "out of school holiday" weekend. as do we - to enable folk dance, music and song to be especially extended towards young people. And: A chance all to try playing Pan Pipes ! 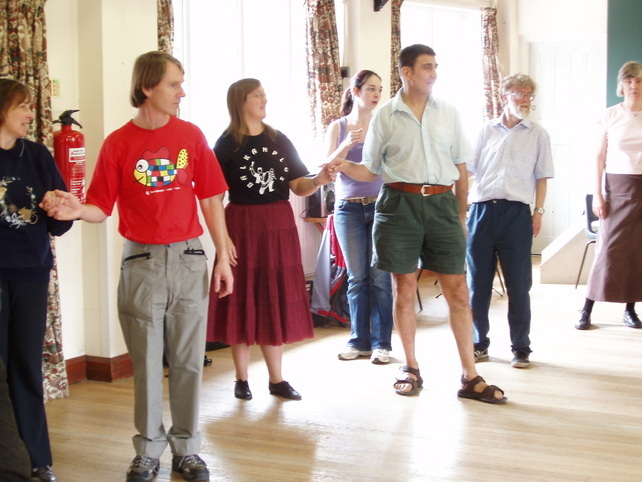 Whilst many have experience in some aspect of folk dance, music or song - We have skills to share. Join and participate with us in this small festival of dancing, music & song. - just £45 for all 4 days. (Return to this page in December. Ensure that you have lined-up Accommodation). - you wish to have a Season Ticket - best be an "Early Bird": and get a bargain ! George Hook. 9.30am Irish Set: George has a brilliantly straightforward way of sharing the intricate, and traditional variety of the ancient Irish set dances. George's main occupation is even more fascinating. A century ago, every good quality shirt had a row of handmade Mother of Pearl buttons. Birmingham their main manufacturing centre. In its Jewellery Quarter, a variety of further fascinating handmade brooches etc were produced. George is the very last worker still producing this beautiful traditional shell hand craftwork, in the Midlands. He maintains his family's firm founded in 1824. See HERE George Hook's lovely website. FRIDAY 5/5/17 PROGRAMME view below / smartphone download HERE Here's the Friday page. SATURDAY 6/5/17 PROGRAMME view on 2 pages below / smartphone download HERE. Here's the Saturday page. Plan to be at Great Alne Hall at 12 noon for the midday walk to Haselor Church? ﻿﻿ - Adrian needs to know ! Season Ticket on LATER BIRD page - £50 for all 4 days for single adult. NOW: Only DAYS to go to book your best bargain: a "Later Bird" season ticket for May: go for - Later Bird Discount Season Tkt page. - Or drop by on a day / evening : Be welcomed - whichever day - at ANY time !
. 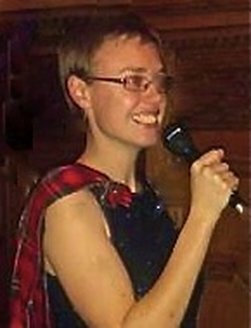 . . Nicola Scott will call for the Contra Dance . . .
Plan to be at Great Alne Hall at 12 noon for the midday walk to Haselor Church? ﻿﻿ - Adrian would like to know ! These are free for you to keep and view - contact Paul on 0121 689 1802. NOW AVAILABLE: book your best bargain of Early Bird for 2017. - Or drop by in May - Be welcomed - whichever day - at ANY time ! But from visiting supervising adults just watching a young child - (eg Maypole or Morris dancing) a token of £2 per child per workshop is appreciated. Accompanied/supervised youngsters are also welcomed at the 9am "open string" guitar playing workshops. ﻿Items specific to this May's event show in each day's details. Some teachers who volunteer their time must still confirm. Choose how you arrange your BANK TRANSFER - BACS (or Faster Payment Service) to pay for your booking. ﻿SO CHEQUE PAYMENT STILL IS - (AND WILL REMAIN) - A CHOICE﻿ AVAILABLE TO YOU! 1) You can most simply do the transfer by phoning your Bank / Building Society from home. 2) If YOU find it more convenient, just visit your bank branch, asking to use their FPS facility. 3) Make the transfer by Internet Banking, if this is your normal preference. With either of the first two choices - NONE OF YOUR PERSONAL DETAILS ARE ON-LINE ! 1) Download and "open" this form which you need. Quote your surname as a reference code to go along with the payment. 3) Email the completed form to Karen at her given email address. 4) You will [normally 2-10 days afterwards ] get back an emailed individual receipt as acknowledgement from us. This way, you post nothing to us, and have no need to write a cheque. You send to us no personal bank details whatsoever ! This payment choice is relatively quick, and can be totally free of paper. We are most appreciative of Karen W's kind administration of these emails: thus making FPS payments possible on this website. Friday 5th May. Sit-down at - 6pm. Menu: If you complete the initials of your meal preference in the table below, this is not “binding”, but makes a helpful shopping guide for us. In your glass Sparkling Champagne-perry, (Similar taste to a Babycham) or Sparkling, sweet, non alcoholic grape juice. Entrée Fillet of smoked mackerel (with parsley & lemon flavouring), served cold with cherry tomatoes & mixed mild salad leaf. Main Course items to include: Oven-roasted Chicken leg portion with Jacket baked potato: (CJpp) with petits pois or (Cjss) with a side salad. OR Filled Jacket Potato: with Cheese (JZpp):(JZss) or with baked beans (JBpp):(JBss) or with coleslaw (JKpp):(JKss). For each, choose petits pois or side salad. OR (Vegetarian): (VIJpp):(VIJss) Oven baked jacket potato & choice of moderately spiced Indian vegetarian filling: eg Dal Makhani. With petits pois or side salad. OR (Vegetarian): (VZJpp):(VZJss) Oven baked jacket potato & non-rennet cheese. With petits pois or side salad. OR a primary option of Salad with Ham (SH) or with Cheese (SZ), or with non-rennet (vegetarian) cheese (SVZ). OR as primary option - 2 smoked plain or parsley/lemon mackerel fillets (M) served hot or cold, & your choice of any hot/cold items above, or with salad & cheese. Sweet Course: Ice cream, (also yoghurt, crème fraiche, cream) tinned fruit:various fresh fruits. Also variety of cheeses and biscuits. Tea / or cafetière coffee after. EARLY BIRD will VERY shortly be ready for this May - HOPEFULLY TOMORROW -so - DO RETURN TO IT SOON ! - NOW: book your best bargain with Early Bird season ticket for 2017. 2017 : Brian Stanton & Rufty Tufty: the main Evening Social Dance. The full evening from 5.55pm is £9. For shorter periods eg main dance only: a smaller contribution is adequate. Fredy just said YES he CAN bring his Panpipes for ALL to try together at 2pm. These are available to view - contact Paul on 0121 689 1802. Shortly available: book your best bargain of Early Bird for 2017. ﻿Evening Dance / Day visits welcomed: Great Alne Long Weekend: Our site's Home page. Contact us -here. Much will go-on during these: 4 days & 3 evenings in May 2017. Nel van der Laan is again our visiting teacher from the Netherlands. HALL : LOCATION : Great Alne and Kinwarton Memorial Hall - CLICK : to view as a full page map. Leave as map / or next, click green satellite-view-box in panel. FULL page display - now click the 3 dots : select "collapse map legend". HALL : LOCATION : Great Alne and Kinwarton Memorial Hall - CLICK : to view as a full page map. Leave as map / or click satellite view box in panel. For proper full page - now click the row of 3 dots : select "collapse map legend". For proper full page - click the row of 3 dots : select "collapse map legend". - has meant that over these years, we've needed to adapt to many changes which have affected the programme that we can offer, and how we use the hall during Great Alne Long Weekend. Under "News" on this link, see how and why the lovely exposed high rafters and purlins on the interior of the originally thatched roof were eventually required to be strengthened for the heavier roof tiles, and hidden behind insulation. We too are now tending to sit at a meal for a period to enjoy the hall's heat retention, in between our main need to turn all heat off. We ventilate everywhere that is possible during long periods of the day and evenings, when actively and energetically dancing. We've better anticipated and prevented heat losses as people leave in the evening, and for the last couple of years, have been enabled a little heating (even with having no longer any log fire in the grate) for final "winding down" sessions. See at the link many other regulars whose venue is the Memorial Hall: and the varied uses for its present facilities. Also, should YOU wish to hire to use its many modern features, there are details of how to download a booking form etc. For Alcester Information On a site which covers ALL of the "Shakespeare Country", Use ﻿﻿﻿Hall postcode B49 6HL﻿﻿﻿ in the "location" box. It may be a good idea to first visit the area for a "tourist day", using that opportunity to view & seek local B&B's. In the surroundings are beautiful villages. Many properties advertise excellent B&B. Some regular weekend visitors find a good B&B and rebook each year. The Throckmorton at Coughton is convenient: also has good B&B. CLICK. Booking.com also offer this list of hotels - all close by Great Alne. "The Stag" however - perhaps listed as the nearest inn to the Hall at Great Alne - is beside the busy A46. An early booking via the main Travelodge website can yield the best prices. It (surprisingly) may be cheaper to book consecutive nights separately. Nel was our main International Dance teacher in 2015, 2009, and on several earlier occasions - including that of the indoor pic in the slides above. A superb, lively contra dance ensued in Bournville, Birmingham. The intention: to publicise the Friday Evening Dance at Great Alne Long Weekend. With many Fridays busy with other dancing, the result last year, evolved into 15 "Brummie Contras"
danced on Sunday afternoons at a regular dedicated venue. David brings his Amateur Radio equipment, during at least one daytime. to make a variety of contacts each year. A pleasant number of these (on those frequencies which will carry that far) can involve the chance to speak directly to Amateur Radio enthusiasts abroad. So please let us know your choices HERE and join our meal at tables in the Hall. You may also wish to - but do not have to - book an early season ticket. We hope we may again enjoy pleasant "live" music from Libby Thompson and David McInnes. You may then still enjoy a reserved cooked meal in the small "Café room", after the Hall tables are cleared ready for dancing. Apologies for problems with the initial form: Early Bird extended to midnight on Wednesday following Easter. Saturday: Fun with Morris etc: quality in song, & brilliant dance workshops. A great and varied evening of Social Dancing. Coming - A lovely visit from Karin Bellaart of the Netherlands. Karin's Bellaart's bright, lively manner is hard to improve on. Temporary provisional programmes: click on THIS year. The INDOOR pic as they change above was of Nel's 2009 visit. 1pm F﻿ri 22nd to late afternoon Mon 25th April 2016. On Fri evening we'll dance in American Contra style. Each evening features its own band and caller. THEN BOOK/COME & ENJOY the events in April. but best get to know Karin Friday afternoon, or especially on our more quiet Mon﻿day. Saturday: Fun with Morris etc: quality in song, & the dance workshops. Rest here is still what went on LAST Apr. THIS April's similar programme very SOON. Meanwhile, Book for 2016, or drop by; visit & pay on the day ! A slightly earlier start, and an opportunity for you individually to walk further. Karin's International Workshop in the afternoon - and a sit-down roast meal from 6pm. Then a few more varied dancing opportunities. with Nel to the "Cole Valley Ceilidh Band". click HERE to see the band playing last year, and the contra dance. A full evening of brilliant American Contra with caller Ja﻿ke Wood follows. Should the prospect be poor weather, the hall will be used for additional workshops. (A small group may nonetheless still prefer to enjoy the walk option).